green eggs and ham, said sam i am! but fried green tomatoes? questioned sam i am. dr. seuss should have taught me more, for fried green tomatoes i know not! Seriously, are green tomatoes a part of common knowledge? Because if they are, I have been out of the loop for the past 25 years! My theory: Dr. Seuss decided to play a joke on the world and make them up. I thought that green tomatoes were a specific species of tomatoes...you have roma tomatoes, plum tomatoes, and green tomatoes...right? Wrong. I was prepping the ingredients and my mother told me to run out in our garden and pick a few more green tomatoes. I looked at her as if she were out of her mind. We didn't have green tomatoes! Au contraire, mon ami. A green tomato is just a tomato that hasn't fully ripened into its red color. Who'da thunk? "No, really! I know someone whose house burned down because they were frying food! The oil is too hot, turn it down! Wait, wait, be careful!" My mother stood over my shoulder freaking out, certain that we would have a grease fire in the kitchen. Carla, I love you, but things worked out just fine. The whole process really turned out being rather painless. We used a Dutch oven on the stove so we would have a deeper working space. Best of all, no splatter burns! 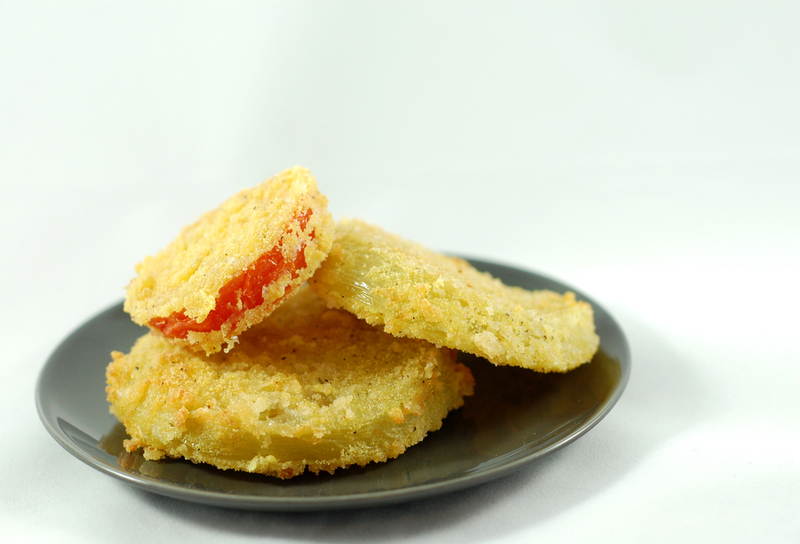 So here's the thing...typically you will use green tomatoes for fried GREEN tomatoes (duh!). However, that isn't to say you can't use red tomatoes. In fact, if you look at the photography below, you will see a little red peeking out from the layer of fried breading. It's doable. Here's the only real difference: green tomatoes are not as juicy so they will stay more firm throughout the frying process. Red tomatoes are riper, so they end up having more juices. Red tomatoes will do, but green is better. Whisk eggs and milk together in a medium-size bowl. Scoop flour onto a plate. Mix cornmeal, panko bread crumbs and salt and pepper on another plate. Dip tomatoes into flour to coat. Then dip the tomatoes into milk and egg mixture. Dredge in bread crumbs to completely coat. In a large skillet, pour vegetable oil (enough so that there is 1/2 inch of oil in the pan) and heat over a medium heat. Place tomatoes into the frying pan in batches of 2 or 3, depending on the size of your skillet. Do not crowd the tomatoes, they should not touch each other. When the tomatoes are browned, flip and fry them on the other side. Drain them on paper towels.